We need to be grateful in life. By reading this, you are stealing time. After all, there are people incapable of even stealing time enough to experience five minutes of joy. As we walk down the road, one man believes his life miserable while the next man believes his life is good. What is the difference? Not a darned thing! Both are living the same life, but one is grateful, full of grace, while the other is miserable. 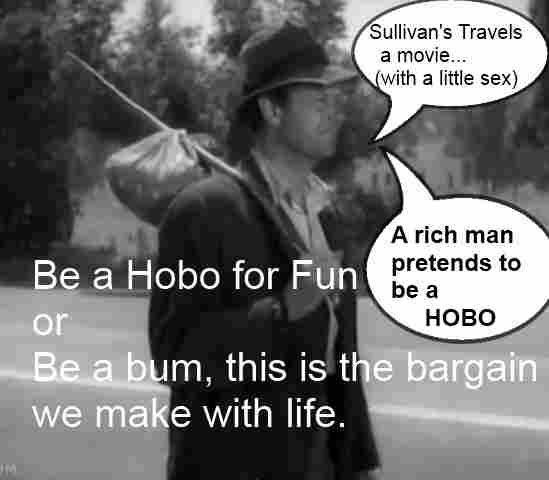 Watch this movie clip from "Sullivan's Travels," in which a rich man pretends to be a poor hobo. (We do know we are not poor, don't we?) It's a great movie. This is the official trailer for "Sullivan's Travels." I am grateful today. It is my obligation to life; it is what I owe life. Sorry to hear about your dad, Andy. :-( Have a safe trip.